Choosing a night vision scope for your gun may prove to be challenging if you’re not sure what you want. There are so many brands, products, and specifications available in the market that the whole idea of picking one might leave you dazed and confused. Then there’s this “little thing” called a budget that everyone has to keep in mind, regardless of what they’re buying. But don’t worry; we researched many models to find out which ones are worth the price and which ones are hype. In this guide, you’ll get to know about our pick of best night vision scopes, so that you can go right ahead and buy one. So, you ready yet? Let’s begin! There are many things to take care of when it comes to visuals. Like magnification, the field of view, clarity and LP/MM, signal to noise ratio, etc. But when it comes to night vision scopes, the two things that matter most are magnification and clarity. Most of these scopes have IR technologies to see targets clearly at night, so make sure you’re not compromising on the quality to save a few bucks. 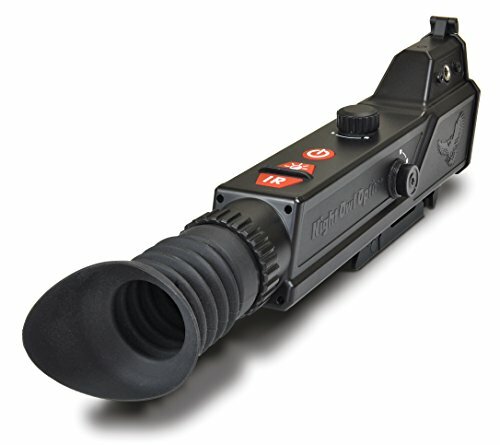 A night scope also functions without IR during the night. Study the sensor size and the luminance gain of the model before buying a scope. The higher the luminance gain, the clearer it’ll be at a farther distance. LP/MM is another helpful parameter on clarity. It stands for lines per millimeter and a higher LP/MM means better clarity. If you already have a scope and it’s not performing at par with your expectations, then you can buy IR Illuminators online to make it slightly better. The current market of night vision scopes have a large variety to choose from, but before you pick one out of the lot, here is a general overview of all the generations that the night scopes come in. With an effective range of 75 yards, the gen 1 scopes provide images which are much lower in resolution, clarity, as well as brightness. It will have more static and noise and heavily reliant on IR illuminators for most of the view. The 2nd generation of night vision optics, on the other hand, have a higher effective range of up to 200 yards (though will depend on the model). With better image resolution and clarity, it can passively function without the aid of IR illuminators. Their monoculars are much more adaptable to different environmental conditions, being more durable than gen 1. They are less susceptible to image blooming as well, which is caused by light distortion. Gen 3 is considered to be S tier when it comes to night vision scopes. Made with the best in optic technology, the Gen 3 scopes have the highest effective range at 300 yards. It has an incredible low light transmission rate and makes its IR functions almost entirely unnecessary when there is even a bit of ambient light around. With better overall performance and almost next to nothing blooming, this generation has been the go-to for the army and hunting professionals. Technically a Gen 4 doesn’t exist. It was initially introduced to the army, which was later found out to be a gimmick which a lot of companies today try to use to exploit their customer base. So watch out for such companies who say that they manufacture Gen 4 scopes at a competitive rate. When people get deep into evaluating all the necessary factors while buying a scope, most forget to check for the battery. While most scopes use AA batteries, some don’t. Make sure that the scope you buy doesn’t use a proprietary battery, which is both expensive and rare to find. Obviously, feature-packed scopes will use more battery. So there’s a fair trade to be made when buying a night vision scope. A night vision scope is a hefty investment to make. So, make sure that the one you buy lasts long enough. Since a scope can have many different parts put together, it’s essential to make sure that not only is it made with strong materials but also light. The scope has to withstand hard recoil impact and a heavy scope is more likely to dismount or fall apart in action. Hence, scopes made from materials like Titanium are better because they are lighter and durable at the same time. Also, before buying, make sure that the gun has enough rail space to accommodate the scope. So here is the list, read on to find out why we believe that one of these 6-night vision optics may be the right choice for you. ATN X-Sight II has the zero range of 100 yards and with HD resolution that provides HD recording and streaming options as well. It proves to be an excellent night scope for the middle of the road price bracket. It has good colors and a great range finding feature, which we found to be quite useful for many tasks. The sheer detail in the image of this scope is remarkable. It has high definition vision along with excellent color reproduction. You can see the target clearly with the level of contrast. It has great streaming features and the ability to stream footage over Wifi to a connected handheld device. You can even take photos in high-definition! The ATN X-Sight II also adjusts the stability of the video when it’s under recoil, which is a nifty feature since most people want to get a clear hit on camera. Two other features that we really like are the Ballistic Calculator and Smart Range Finder. The Ballistic Calculator helps you take long shots by telling the point of impact on the fly in a fairly accurate fashion. On the other hand, Smart Range Finder calculates the range to the target and adjusts the point of impact accordingly. We wouldn’t say that it’s a must-have for a scope, but it sure helps. One gripe that we had with this scope was its weight. While we didn’t experience any major problem using it, some users have complained about how it can’t sustain the recoil of their guns. Given the kind of image clarity and the video capturing features in the model, its weight can be overlooked. But we still recommend you to evaluate the pros and cons before buying. Has amazing picture quality, and it streams and records in high definition as well. Features like Ballistic Calculator and Smart Range Finder are incredibly helpful. The zero range (100 yards) is remarkable for the price. The scope feels heavy and it’s been reported that it can get loose from the mount of some of the guns over time. Sightmark SM18008 is a decent budget option for someone who’s not yet ready to spend thousands of dollars on a night scope. However, don’t let the price tag fool you. It is one of the most reputed night vision scopes out in the market for reasons we’re about to explain now. 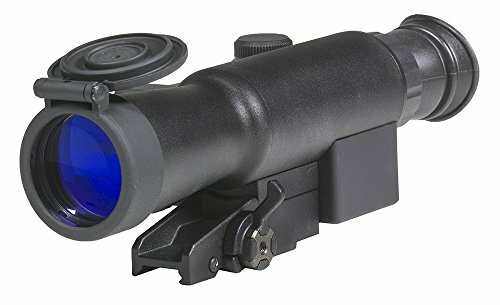 This scope performs incredibly well at medium range after the sun has set. Nothing seemed to jump out to us as a problem. We could easily shoot something in the range of 60 yards with great clarity but we found it working okay even as far as 100 yards. The daylight performance can be a little underwhelming but that’s a given since most people who’d buy this would use it at night anyway. If you want even better vision at night, patch it up with some other illuminator like the T20 IR illuminator. The battery life is decent and it lasted for about 4-5 hours before starting to signal low battery. 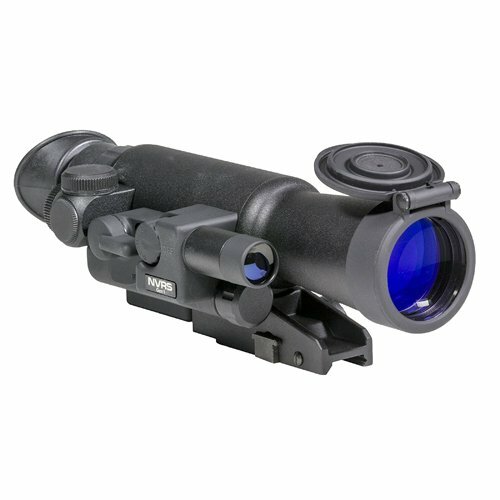 Considering the light weight and the price of this scope, it performed well beyond our expectations. One small aspect that we really appreciated was how well it is built for recoil. The impact when shooting the gun with this scope on turned out remarkably low in some instances. Obviously, it depends on what gun you’re using but overall we found that the rubber ring at the eye position helps reduce a lot of recoil impact compared to other scopes. Overall, the Sightmark comes as a strong recommendation from us not only if you’re short on cash, but also if you want a good well-rounded scope. It has great battery life and a sleek profile but most importantly, it performs admirably at night. It is a sleek, light and well-implemented design. We really loved the fact that the recoil feels a lot less substantial when using the scope. It has decent battery life and performs remarkably well at night, even compared to its more expensive competition. Not suitable for long-range shots. Firefield FF16001 is the cheapest option on this list, but performs reasonably well and is reliable at all times. We wanted to put an option for someone just starting out with hunting at night and found this model to be ideal for many reasons. It is pretty cheap, gets all the basics right, and ideal for beginners. But will it be the right choice for you? Let’s find out! The FF16001 has a titanium body, so you can be rest assured that it’s going to be durable. With the light frame and the IR being inbuilt, it can take on a lot of rough use. We tried and tested it extensively and found that it can take a lot of stress. With the IR, it can last up to 20 hours on charge or 50 hours without. In our testing, we found it somewhere around 16-18 hours on an average with the IR on the entire time. Unfortunately, we don’t have data on how the battery performs without the IR. Overall, we’d say that the battery life is pretty incredible. We found the scope straightforward and hassle-free to use, which is great for someone who is not much aware of the nuances of a firearm and its components. Especially, the mount and unmount mechanism was absolutely a breeze. Talking about the performance at night: it’s okay at best. It gets the job done, but there are some gripes. 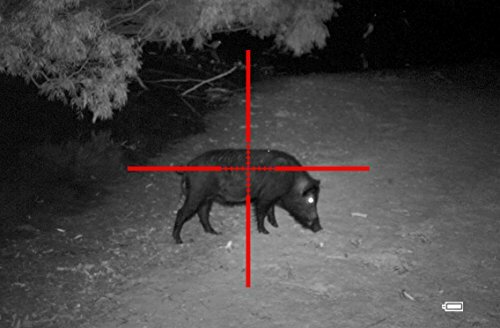 First, the image quality is mediocre at max, and with the IR you can hunt within a range of 100 yards. But the bigger problem is the general blurriness of the image and the noticeable black spots you can see all over the scope. It doesn’t hamper hunting more than it hurts the quality of the product. But it didn’t go unnoticed so we felt like it should be mentioned. Overall though, it’s a great product for newcomers. It’s the cheapest entry and provides great durability. The design is light and it has built-in IR with amazing battery life. It’s hassle-free and straightforward to use, making it great for a beginner. The image quality is less than remarkable and with the black spots, it has to be the weakest attribute of this scope. For the serious and all-out hunters, ATN Thor is the best night vision scope you can get for the money. It is the most expensive entry on our list, hovering somewhere around $3XXX online. But for the money, you get a product with no compromises on image quality, build, and extra features. It can also record and stream videos like the other ATN entry on this list. This scope comes with a 384×288 sensor, which captures images and videos in great quality. It primarily uses heat to see in the dark instead of light. As a result, it is fantastic for spotting even in complete darkness. Paired with the smooth and effective zoom, it makes spotting targets at night a whole lot easier. Both the ballistic calculator and the built-in smart rangefinder works incredibly well. 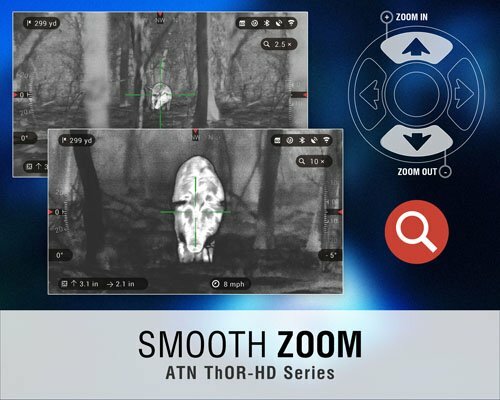 The ATN X-Sight II also has these features but in Thor, the features are implemented even better. The product can be a tad bit on the heavier side but the design is robust, and no amount of recoil or impact seems to harm it in any way. The included buttons and the lens seem pretty durable as well. We tried it for a couple of months, hunting on weekend nights, and it has yet to show a problem. It also has the same recording and streaming features as the X-Sight II and works perfectly while capturing and delivering smooth 1080p footages and HD pictures. So, you can easily show off your night-time adventures to your friends without having to mess with various settings. One thing that bugged us a little though was the battery life. This scope a power hog and that’s no exaggeration! It is somewhat justified given the truckload of features but it still falls short on the mark of being 100% satisfying. It has an extremely rugged design. It has a great sensor which makes it possible to hunt in pitch black darkness as well. It has features like Ballistic Calculator and Smart Rangefinder. It’s expensive and a power hog. A great night vision scope is not only judged by its features and optic clarity, but by its ease of use and convenient functionalities as well. 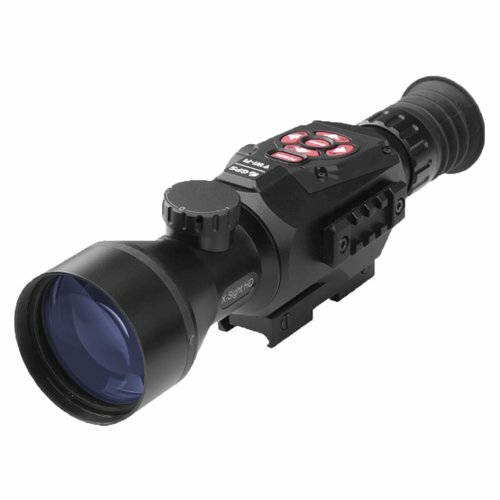 Take the Night Owl Optics’ Night Shot for example. 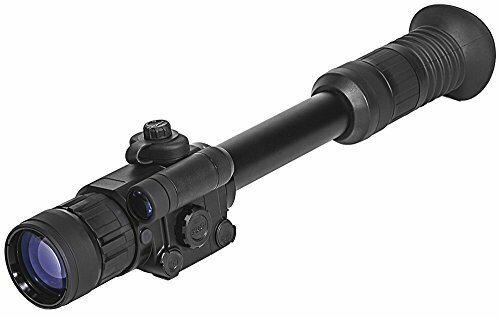 Its one of the few scopes that are equipped with features which solely cater to familiarizing the amateur hunter to the field of nighttime game hunting. This scope is light, portable and supports a large ‘clear field of view’ for optimal target tracking. 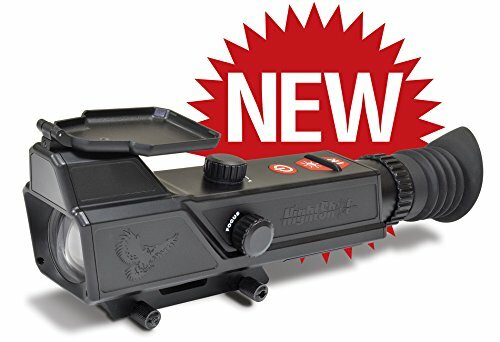 One of the most exciting aspects of the Night Shot, is that when using it in a rather open field or a large hunting area, it will help you identify your targets at distances well over 150 yards. For better convenience, the Night Shot has a mount that is built into the optic. This improves the balance when hunting as it allows the scope to sit lower on the bore axis and not weigh the rifle down. The scope also comes with a flip-up lens cover which not only protects the objective lens but the infrared illuminator as well. This also keeps the scope waterproof and resistant to unusually foggy weather. 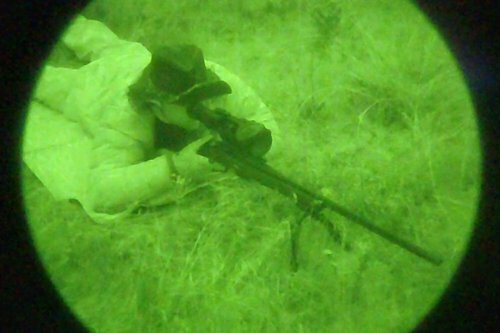 The Night Shot excels at shooting any target within the 200-yard range mark, but for objects beyond that, the image might just be a bit blurry. However, one complaint that we do have about the scope is that the lens at times fails to pick up the surrounding ambient light. The IR would get activated completely everytime we switched the scope on. And then when we manually turned the IR off, we couldn’t see much out of the reticle focus even if there was a lot of ambient light around. Though the night shot advertises itself to be solely for night time use, we felt a bit disappointed that without the IR the image is pitch black even with sufficient ambient light. One of the best entry-level night vision hunting scopes in the market. 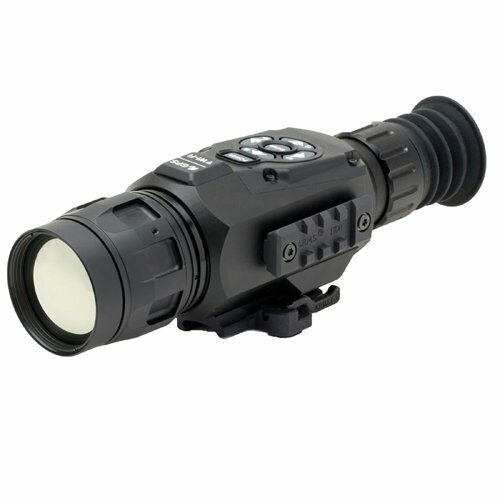 Light, portable with a rather large field of view which will allow you to track a target beyond 150 yards. Convenient flip up lens cover for improved durability. Mount built into the optic for better balance and precision. Doesn’t pick up any ambient light at all. Not many night vision rifle scopes come with the more domestic hunter and sportsmen in mind. As, they are specifically modeled around military and law-enforcement use, using them for chasing coyotes, or hunting boars is rather impractical. But that is not the case with Armasight’s Nemesis 6x-SD Gen 2+. Even though provided with a ‘near military grade’ technology, it is equipped with certain features that make it perfectly capable of nighttime game hunting. Amazing versatility at an affordable price is the name of the game for the Nemesis 6x. And much of what makes it so very flexible is the vast array of customizable options that come with it. Though usually, the Nemesis has SD or ‘standard definition’ image clarity by itself, it also comes with an image tube which acts as a high-quality image intensifier. Not only does this improve the overall clarity of the image, but helps to keep the shooter focused throughout the hunt. Additionally, the Nemesis will also provide you with the option of selecting a more powerful phosphor tube to go with the scope. This will significantly enhance the definition, while the “Quick Silver” option with white phosphor will allow the more natural black and white night vision instead of the green. But, perhaps the most exciting feature of the nemesis is the illuminated red center crosshair. It’s incredibly well-defined and easily discernible through the sights and can be adjusted frequently to enhance shot precision for the smaller targets. The digital auto brightness adjuster along with the remote control feature will help you remain steady as you take aim. However, though all these functions make the scope relatively convenient to use, it takes a rather heavy toll on the battery, making it reliant in frequent recharge. Multi-coated lens for improved light transmission. Auto Bright and Remote control will keep you focused on the target. The red center crosshair provides excellent shot accuracy and precision. Multiple customizable image quality options. Too many features drain the battery much faster than other models of its class. And that brings us to the end of this guide. 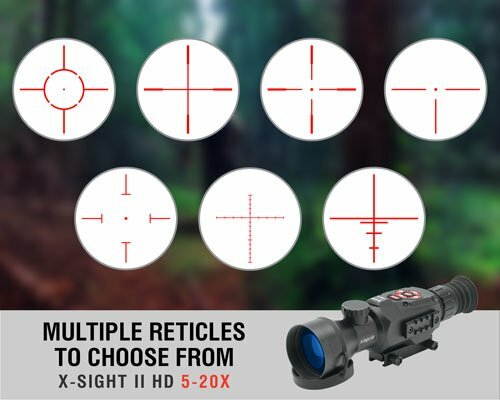 We’ve listed all the best night vision optics that you can buy right now, each being unique in their own respective price range. But still, we’d recommend you to evaluate your needs first and then make a purchase. That’ll be all. Till next time! If you are looking for a traditional scope, you can check our guides on which are the best scopes for a rimfire rifle, Remington 700 and 270 Winchester.